The poll also showed a large generation gap among Latinos on how immigrants should engage with U.S. culture once they're in the country. Among all age groups, 49% said it's better for immigrants to blend into U.S. culture, and 44% said it's better to for an immigrant to maintain his own culture. Among Latinos aged 50 or older, 62% said it was better for immigrants to blend into the culture of the United States, and 33% said it's better to maintain an immigrant's own culture. Younger Latinos felt differently – 45% said it's better to adopt the U.S. culture, and 49% advocated maintaining an immigrant's own culture. On Tuesday, CNN released poll numbers showing a majority of likely Latino voters favored Obama over his rival, GOP nominee Mitt Romney. 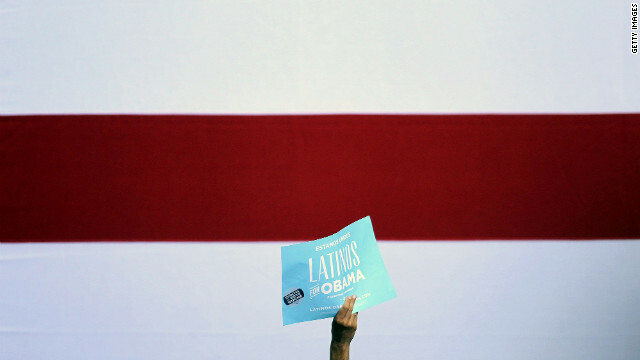 The poll put Obama's support among Latinos at 70% and Romney's at 25%. Seventy-four percent of Latinos said Obama would better handle immigration, while 20% said Romney was better prepared to handle the issue. 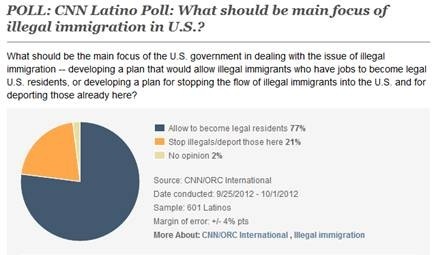 The CNN/ORC International poll was conducted by telephone from 601 adult Latinos between September 25 and October 1. The interviews were conducted in English and Spanish. The sampling error for all adult Latinos was plus or minus 4 percentage points, and among likely Latino voters the sampling error was plus or minus 5.5 percentage points. Not so popular with South Americans is Mexico's policy of imprisoning illegal immigrants for up to 10 years; turning a blind eye when gangs and drug cartels kidnap and/or murder illegal immigrants; or Mexico's policy that they can deport immigrants who do not have a means to support themselves or if they are considered to be bad for the economy or the national interests. What's Spanish for "hypocrisy"? While Romney/Ryan aggressively attack without facts, President Obama is waking-up everyday fighting for all Americans to have a fair shot and to enable Americans to have the liberty and pursue their happiness. Except the Americans that can't get jobs because an illegal immigrant has it. Not too many of those, to be sure. So Obama did the math and realized he can sacrifice them and the losses would be offset by overwhelming support from the Latino community as a whole. But that's not cold and calculating at all, is it? Having been born in US I feel fortunate. Fortunate that we've fought to keep our govt in check. Maybe someone should fight to keep other govts in check so that people don't have to change where and how they live.! It's votes that will elect the next President- not lies. I honestly think that Latino's have no clue what they are voiting for. Obama gives a visa.... which is temporary and expires. Romney says he'll top that and give the same qualified a permanent visa thats not temporary and can work their way to Citinzenship. No, Obama works everyday to make the lives of all Americans better, regardless. Latinos are also Americans or de facto Americans -members of our families and communties- and Obama cares about them too. He works for the working class, working women, middle class. Romney works for the one percent, hides his money off shore, sides with those who out source with China, wants to cut programs that invest in education, infrastructure, health care, environment, energy, small business, etc, while not being able to say no to the racist, ethnocentrist, homophobic, anti-woman, war mongering crowd in the GOP. What does the media say "Obama is ahead".......Yeah sure..........!. I believe that an amnesty shoul take place right away to pay back for the sorrow and tears that the Obama Administration has caused the US, Mexico and other South American Countries. There is record of at least 3 arm deals with Hispanic drug cartels going bad in his administration. Border patrols are being killed by the same guns and record deportations are just a dog bone to get hispanics to vote for him again. Mr Obamas administration is the majority of the cause for the drug cartels killings – if they did not receive a free ticket to buy powerful guns in the us and if the us government did not let the arms go through security – there would not be so many deths. A bright future with someone who understands business wants to move America ahead. CNN's boy get walloped and they scrambling in the aftermath.they will publish anything positive about Obama today. He is a horrible president. I read stupid comments that Obama is more like-able? So the presidency is pure popularity, I know that plays into it but give me guy who is a unlike-able but can run the country and get us out of this financial mess (that Obama made worse) He does not deserve a second term. Romney gets my vote and if he fails I will vote against him next time around. For those who consider the social issues as the priority if we do not improve this economy we will go broke as country an watch how nice we are too each other when unemployment sky-rockets into double digits, the stock market tanks. It is going to get ugly Obama and the Dem do not have the horses to turn the tide. I am not a die hard republican but I am die hard american. I am not saying romney is absolute correct answer, we need more options but that is a seperate discussion. Get Obama Out! Or we are doomed! Obama proved he's an empty suit/chair last night. No facts. No truth. As a LEGAL immigrant I am not impressed with the Latino community's insistence that they be given special consideration simply because they are Latino. The policy of automatically giving someone citizenship simply because they were born in this country to non-citizens needs to be reviewed – and this is coming from someone whose children have been born in the US. US citizenship is a priviledge, not a right. Amazing how those of us applying for a Green Card have to sign a contract stating that they will NOT become a burden to the state, yet hospitals cannot turn illegal immigrants away for any reason. The average birth costs about $10,000 – and that's when a healthy child is born without complications. Think about that the next time the government decides to take a bigger chunk out of your paycheck for payroll taxes. Someone has to cover the cost of all this free medical care...And let's not even get into what it costs communities to educate these children when their parents are being paid cash and pay no payroll, property, school, state or federal taxes. I would just like the Latino community to answer this one question: Why does anyone from outside the US have a RIGHT to enter our nation and become a citizen when that right does not exist in countries outside the US.? It is most noticeably absent in Latin American countries. Why do we have a responsibility to be the exception to that rule? And don't give me any quotes from the Statue of Liberty. That was a gift from France and France does not exactly have an open door policy on immigration. HELP has anyone seen the preses backside??? Last time i saw it was when it was getting kicked through Colorado !!! Interesting to see if Romney can catch up in the battle ground states. The teleprompter FAILED last night. Well, no comment from the Latino community regarding Latin America's immigration policies. Their silence speaks volumes. Mexico is a sewer and Obama is willing to make the U.S. more like Mexico to win the election. You should be ashamed Mr. President illegals cost tax payers over 110 billion a year, you give taxpayers the bill and you get the votes.